Over the past two decades, innovations in satellite technology and processing algorithms have generated improved regional and global snow mapping products. With a range of satellite-derived snow products available, we aim to clarify which products might best serve the climate modeling community. One way to examine this question is to first investigate how climate models portray snow, specifically looking at how modeled snow-atmosphere fluxes are affected by the type of snow albedo parameterization. 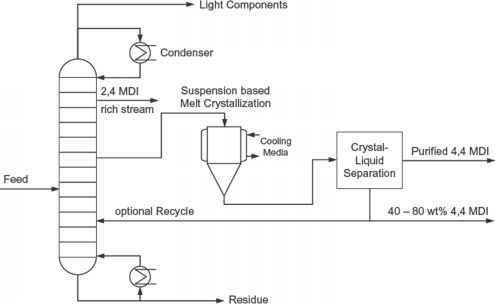 The objective of this paper is to provide a better understanding of the sensitivity of surface-atmosphere fluxes to albedo parameterization and, given these results, recommend and describe appropriate remote sensing snow products for climate simulations. Remote Sensing and Climate Modeling: Synergies and Limitations, 159-180. © 2001 Kluwer Academic Publishers. Printed in the Netherlands. annual pattern of snow accumulation and ablation are controlled by atmospheric processes. However, there exists ample evidence that snow cover affects atmospheric temperatures and circulation at local, regional and even hemispheric scales (Dickson and Namias, 1976; Dewey, 1977; Walsh and Ross, 1988; Barnett et al., 1989; Cohen and Rind, 1991; Walsh, 1993; Groisman et al., 1994; Walland and Simmonds, 1997; Gutzler and Preston, 1997; Ellis and Leathers, 1998; Clark, 1998; Cohen and Entekhabi, 1999; Frei and Robinson, 1999). Although this feedback involving snow albedo and air temperature has long been considered important, the magnitude of its effect on surface-atmosphere fluxes is only just now becoming known. Snow albedo (a) in the optical region (0.4 - 2.5 jam) ranges from 0.98 in the visible part of the spectrum to near zero in the shortwave infrared region. 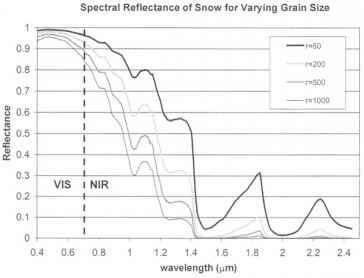 Spectral albedo also varies strongly as a function of surface layer grain size with near-infrared values decreasing markedly as snow grains become larger. Figure 1 shows both the spectral and grain size dependencies of snow albedo. For clean, deep snow, grain size is the primary physical property governing snow albedo (Wiscombe and Warren, 1980; Warren and Wiscombe, 1980). The rate of grain growth depends strongly on snowpack temperature and temperature gradient (Colbeck, 1979; 1982) and multitemporal observations of grain growth have been related to changes in snow-pack thermodynamics and snow albedo (Nolin and Stroeve, 1997). In Section 2 we demonstrate the sensitivity of snow surface-atmosphere fluxes to selected parameterizations of snow albedo. We describe how snow grain size affects albedo, thereby governing heat fluxes. In Section 3 we describe the complexities of mapping snow cover and albedo and discuss remote sensing limitations affecting the use of satellite-derived snow products in climate simulations. We identify new and planned remote sensing products that will be most useful for snow extent and albedo mapping.